Every week we're faced with the task of writing a post for our family history blog. Every week we hit publish and hope we crossed our t’s and dotted our i’s. It can be a daunting task to self-edit your own blog posts before they go live. When you write a book you have the luxury of completing all your writing and revisions upfront and then pay a professional editor to help you fine tune it before you head to publishing. In the world of blogging you hit publish each and every week, sometimes several times a week with little time and attention for edits. Each time we click publish, we want to present ourselves in a professional light. Yet each and every week we are faced with deadlines, schedules and life’s chaos. Our weekly posts can sometimes be done in a rather rushed and hap-hazard manner. Regardless of whether you are following the family history blog to book project, or writing a how-to genealogy blog, editing your blog posts shouldn't be a quick once over. We are all guilty of not taking time when it comes to the editing process. 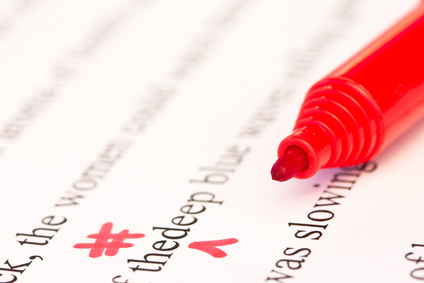 While spell check is a wonderful thing it shouldn't be your only method of editing your blog posts. Below are some tips and tools to help you edit your blog posts in a more organized fashion. After reading over the tips be sure to download the Peer and Self-Editing Worksheet, a tool to help you identify any weaknesses in your blog posts before you hit publish. 1. Walk Away – Give your post time to sit. After having written and revised my blog post several times, I walk away from it. Sometimes for a few hours, sometimes for the remainder of the day but never any longer than a day. This time away helps me to come back to it with a fresh perspective, a clear head and this in turn allows me to see my message more clearly and recognize any errors. 2. Read it Out Loud – several times, first looking at it from a story perspective. Does it follow a natural progression, is the story clear. Read it slowly and out loud making sure you say every word. Often we know the post so well we tend to read the sentence without really seeing the words. If I stumble over a sentence that's usually a signal to me that perhaps that sentence needs some attention. 3. Remove Unnecessary Words – this is a biggy for me. I also find the more I work on this the more I am aware of it in my initial writing. Say what you need to say in as few words as possible. 4. Read It Out Loud Again- I can't stress this enough. This time around focusing on complete sentences grammar and punctuation. 5. Complete A Grammar Edit - Are you using everyday language? Is your punctuation correct? I keep The Little Red Writing Book close by for easy look ups and a refresher for structure, style and grammar. 6. A Peer Edit - If I have the time or I'm finding a post particularly challenging, I'll ask a friend or family member to review my post. A second set of eyes is always best for editing but not always practical in blogging. Find yourself a blogging buddy who will exchange peer edits. 7. Don’t Sweat It – If you catch an error after hitting publish or a reader picks up on an error go back in and correct it and move on. Don't beat yourself up about it. 8. Use The Peer and Self-Editing Worksheet - Print this worksheet off and keep it handy when you are self-editing your blog posts or better yet send it to friend, a fellow blogger and ask them to be a peer editor. Do you have any tips or tricks for self-editing your blog posts? Share them in comments.